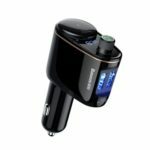 This product is a special Bluetooth car charger that can switch the call to the hands-free state via the professional Bluetooth modules as long as the mobile phone is provided with the Bluetooth function. 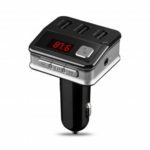 It can also send the music in your phone to your car stereo wirelessly. 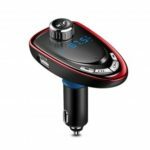 You can enjoy the music and answer the call in hand-free mode without refitting your car, which ensure the driving safety while enjoying music. 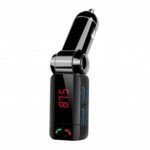 180 degree adjustable angle with easily-viewed LCD display, fit for most cigarette lighter socket with different location on different cars. Max. 5 /2.1A output, support to charge two electronic devices at the same time in a fast speed, save your time. Built-in noise reduction circuit, clearer calling sounds, to experience the immersive call. Built-in Mic, you can make hands-free calls easily and safely. Just one click to hang up/off when receiving a call. Support TF card/ USB flash drive/AUX expansion or pair with music app on the phone to play music in MP3/WMA/WAV formats. Automatic monitor the voltage and give out alarm prompt for abnormal trouble. Driving has never been so safe. Works well with most Bluetooth enabled devices. 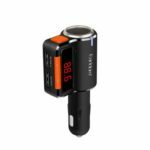 Compatible with iPhone, iPad, iPod, tablet and Android smart phones etc.